I love Loin Lamb Chops. Tonight I made some with a Peach preserve, horseradish cream, mustard powder and a little orange juice for the glaze. 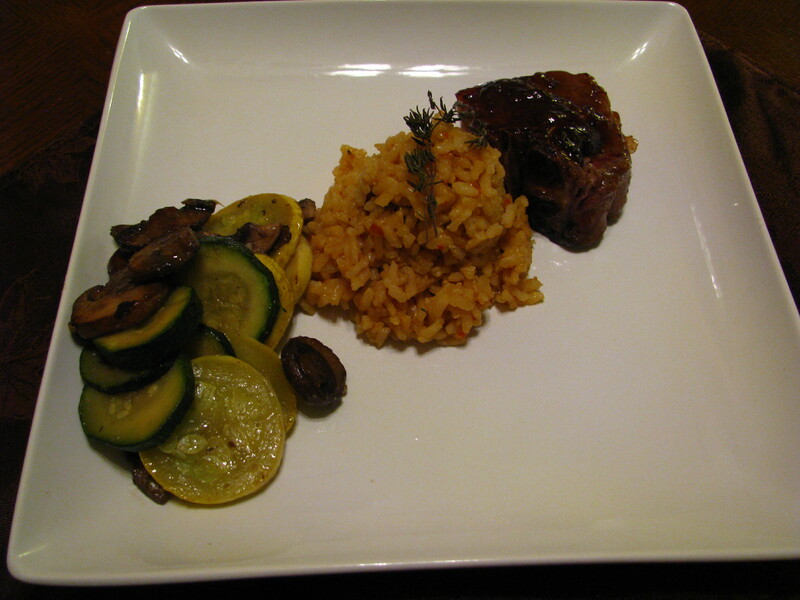 On the side I had some Sun dried Tomato risotto, and a mix of yellow and green zuchinni and muchrooms. What a lovely combination this was. A very light and summery dish. I just wish I could get BIGGER cuts of the soft and tender loin lamb chops. Food For Thought: Sun dried tomaotes are ripe tomatoes that are placed in the sun to remove most of the water content from the tomatoes. Cherry types of tomatoes will lose 88% of their initial (fresh) weight, while larger tomatoes can lose up to 93% during the process. As a result, it takes anywhere from 8 to 14 kilos of fresh tomatoes to make a single kilo of sun-dried tomatoes. After the procedure, the tomato fruits will keep their nutritional value. The tomatoes are high in lycopene, antioxidants, and vitamin C, and low in sodium, fat, and calories. Sun-dried tomatoes can be used in a wide variety of recipes and come in a variety of shapes, colors, and tomatoes. Traditionally, they were made from dried red plum tomatoes, but they can be purchased in yellow varieties of tomatoes as well. They may also be preserved in olive oil, along with other ingredients such as rosemary, basil, dried paprika, and garlic. How did you do the lamb? I’m always looking for a good way to fix it. Is there a recipe you followed for the glaze? I’d love to try it!! The sun dried tomato risotto sounds amazing!